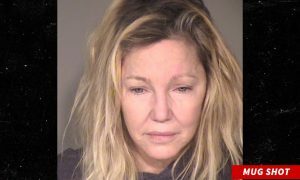 Heather Locklear was taken to the Los Robles Hospital & Medical Center from her house in Westlake Village, Los Angeles on Thursday afternoon. He sister Colleen called 911 because Locklear mixed medication with alcohol. It has been reported that Locklear was taking Xanax prior to being admitted to the hospital. The drug is used to treat anxiety and panic disorder. Heather’s condition is listed as medically stable. Some believe that her problems stem from the end of her relationship with fiancé Jack Wagner back in 2011. Locklear is scheduled to be released from the hospital at some point over the weekend. Right now she is being looked after by her parents. Locklear has dealt with a difficult couple of years. She was arrested in 2011 and then cleared for a hit-and-run accident. She hit a No Parking sign in Ventura County, California during that incident. Back in 2008 Locklear entered rehab to seek treatment for depression and anxiety. A spokesperson from the hospital said that Locklear was awake and responsive when she arrived at the hospital yesterday. The spokesperson also said that Locklear is also responding well to treatment. Locklear has had problems with prescription medications in the past. In 2008, Locklear’s doctor called 911 because he feared Locklear had overdosed on prescription medication. The operator talking to the doctor described the incident as a suicide attempt but everything turned out to be a false alarm. As recently as Tuesday, Locklear was at the Los Angeles Lakers game hanging out with w friend.